Clearest such image so far. That pyramid must have been built by some very tiny Egyptians. Did we all evolve from tiny martians that were transplanted to Earth? More oxygen here, and we got larger? may be the tip of a pyramid showing above the ground, who knows, they don't provide any sort of a key to scale. But it is definitely artificial. No "pyramids in that image--i wonder if Gunga can explain this discrepancy. If you open Gunga's image in a new tab, you don 't the URL for the JPL photo, you get a URL from Facebook Canada. As so often happens, Gunga has a source who is playing fast and loose with the truth. Shatter cones are quite common on Mars, where the thin atmosphere does not cause meteors to break-up or burn-up before impact with the surface. I assume anybody with reasonable intelligence can find the pyramid in question in that original NASA image. That obviously doesn't include Setanta of course but if anybody who's never given me a reason to put them on ignore needs any sort of a description of where on the NASA image the pyramid is, I'll be happy to provide it. Yeah! They are right next to that herd of camels. actually set, the little pointy rock is there. Uppper right. Actually, Gunga's image is the same photo, doctored . . . 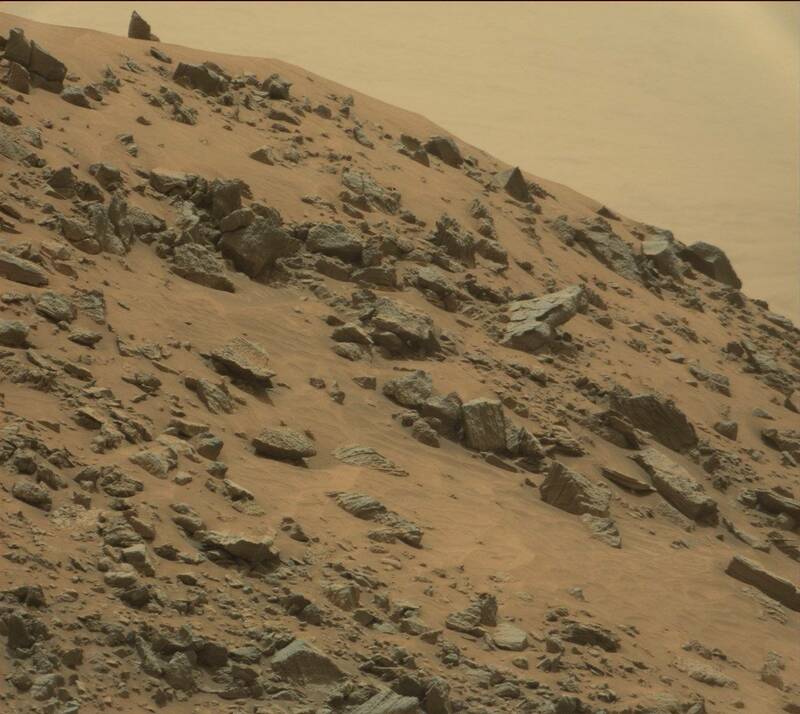 In the JPL photo, the contrast is not as high, and the colored background is not there to provide contrast. In Gunga's photo, which is the doctored photo, there appears to be a regular step formation, which is the product of pixilation in enlargemnt--that does not appear in the JPL photo. Look at them again, and compare Gunga's photo to the JPL photo. I think it's hilarious that Gunga claims to have me on ignore, but feels compelled to respond to my criticism. It ain't ignore, Gunga Dim, if you peek. Have a look at the shadows, too. There is no pyramidal shaped shadow, in either photo. It looks like a pyramid shaped (not even a perfect pyramid) rock to me. Can you prove it's not just a rock (which it clearly appears to be)? If you can first prove it's not a rock then I will consider other possibilities. But until then; It's a rock. Certainly a strange looking rock...and it does look like a small pyramid...or a square or oblong object with only one end sticking out of the ground. As you said...until shown to be otherwise, it should just be considered a rock. I strongly suspect that the tip is a pixelation artifact. Roswell's point is well taken, apply Occam's razor. I'm sure, it's one of the parts left from the former Maya embassy. The two visible sides are two perfect equilateral triangles. Nature does not do that sort of thing. 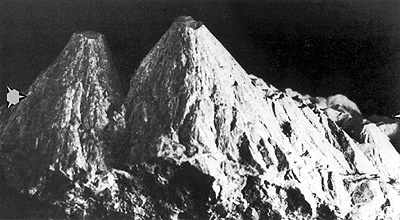 So let's recap: Neither the JPL photo, nor the photoshopped image show a pyramid. Only Gunga Dim claims that there is a pyramid, and it's sad to think anyone else here would swallow that on the basis simply of his having said so. No part of the images shows a "perfect" anything. We don't know what the side or sides of the object which are not in the photograph look like--therefore, no one here can say with any authority that it is (or is not) a pyramid. You know, if scientists never see a black swan, that doesn't entitle them to say that all swans are white. The most they can say is that all the swans they've seen are white. Gunga Dim is attempting to peddle here a claim that he knows what is on the other side of this rock without having seen the other side of this rock.